KQuIP is a dynamic network of kidney health professionals, patients and carers who are committed to developing, supporting and sharing quality improvement in kidney services in order to enhance outcomes and quality of life for patients with kidney disease. This is achieved through collaboration with our partner organisations detailed below. 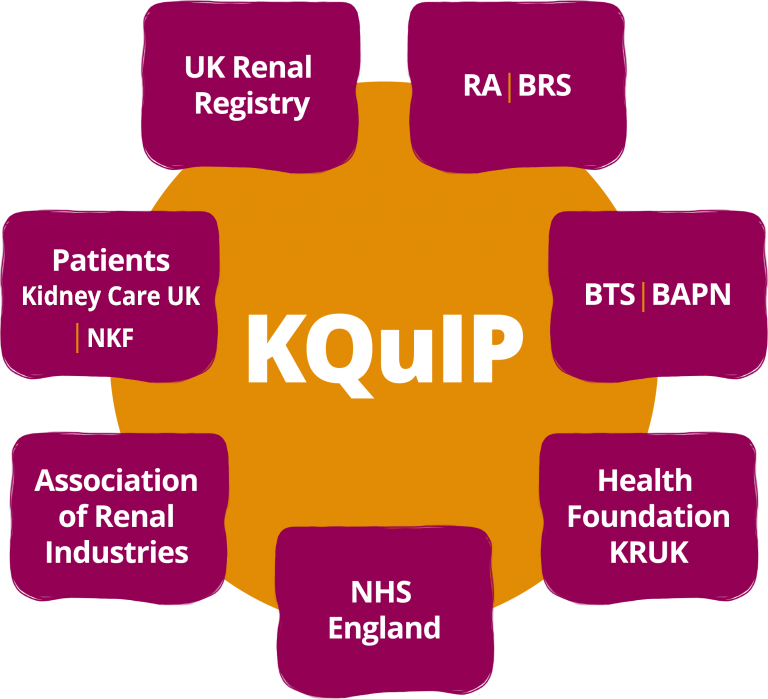 The KQuIP Founding Partners are key stakeholder organisations within the renal community. These organisations have led the development of the overall strategy for KQuIP and have representation on the Board. The Founding Partners are committed to and supportive of KQuIP and its future development and aims. The UK Renal Registry (UKRR) is part of the Renal Association and its core function is to collect, analyse and report on data from 71 adult and 13 paediatric renal centres. The Registry collects data on patients with kidney failure and kidney disease from which it prepares an annual report for providers and purchasers for comparison and research purposes, as well as to drive improvement. The Registry also works in partnership with other organisations to run kidney related improvement programmes. As a partner in these collaborations the Registry ensures these programmes are delivered to time and on budget, achieving all deliverables. KQuIP is one of the programmes and as a partner the Registry is fully supportive of its development and aims. The Renal Association is the professional body for UK nephrologists (renal physicians, or kidney doctors) and renal scientists in the UK and is a fully involved and supportive partner in KQuIP. Domain 4 of The Renal Association’s strategic plan is about quality and practice; one of the objectives is to provide expert clinical leadership to support the whole MDT in enhancing safer patient care and service quality improvement in all aspects of kidney disease. As an umbrella organisation for multi professional and patient representation in kidney care, the British Renal Society brings together a committed audience, with the shared agenda of promoting safe, effective, appropriate and timely care for all people with kidney disease. The BRS will harness and develop strong multi-professional involvement and influence within the KQuIP network. Using its potential for education, research, and clinical development across the whole multi-professional renal care team, the BRS will continue to support the advancement and implementation of Quality Improvement initiatives. The British Transplantation Society (BTS) is proud of its reputation as a multi-disciplinary Society that represents the professional voice of transplantation in the UK. Membership is open to all professionals working in the field of organ donation and transplantation from a wide range of specialties and academic backgrounds including medicine, surgery, basic science, histocompatibility and immunogenetics, nursing and other professions allied to medicine. The aim of the Society is that all members of the transplant community are BTS members. The BTS is committed to ensuring access to transplantation for all patients with organ failure who would benefit from a transplant. The KQuIP initiative is aligned with the Society’s ambition to ensure that access to timely transplantation for all suitable recipients with end stage kidney disease is made a reality across the UK. Kidney Care UK is a charity which works to improve the quality of life for adults and children with kidney disease. It does this by giving support, information and grant aid to individuals as well as to kidney units across the UK to help improve services and patient care. Kidney Care UK, as a partner organisation in KQuIP has added great value, bringing as it does a strong emphasis on the patient perspective as well as knowledge and experience of quality improvement. Kidney Care UK have also provided funding to support the delivery of quality improvement within the kidney community. It also runs the secretariat of the All Party Parliamentary Kidney Group. The NKF spends 60 percent of its resource and time fighting for improvements to renal services and therefore sees KQUIP as a suitable and compatible extension to that role. The Association of Renal Industries (ARI) is a voice of the renal industry to the NHS, government, patients and the clinical community. Our membership is made up of renal based companies comprising the speciality areas of: devices, pharmaceuticals, service, nutrition, consulting, imaging and venture capital. The ARI is committed to supporting new partnership ways of working across both the NHS and industry without boundaries to promote and optimise outcomes for patients. Our interest and commitment to KQuIP is reflected in the aims of our association; To be a vehicle for the two-way communication of developments and innovations between industry and the NHS; to develop an environment for true collaborative working with all stakeholders, and to deliver industry consensus to all stakeholders within the renal community for the benefit of patients. The BAPN are committed to improving the quality of care for children with kidney disease and supporting and empowering their parents. KQuIP provides the opportunity to collaborate nationally in the spread of good practice; streamline pathways of care and explore innovations that challenge traditional service models. The KQuIP forum provides a space to canvas the opinions of the wider stakeholder group. The BAPN welcome the opportunity to participate in KQuIP. Part of our mission at Kidney Research UK is to improve treatments for people with kidney diseases and enhance their quality of life. Placing patients at the heart of what we do, we are committed to enabling the widespread adoption of best evidence and ensuring that this is sustained to improve quality of care. The charity has championed translational research, gaining a strong track record in managing quality improvement projects. We welcome the opportunity to be part of the KQUIP Board, working together to focus on key priorities, accelerating progress and delivering benefit for patients sooner.